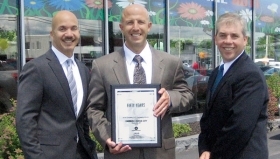 Alex Carbone, center, of Carbone Dodge City (Dodge-Chrysler-Jeep) in Yorkville, N.Y., receives a 50-year award for Dodge from David Littlejohn, left, Chrysler Group's area service and parts manager, and Paul Barbato, Chrysler Group's area sales manager. 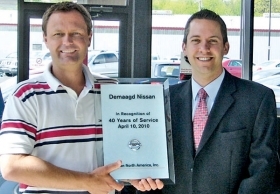 Jim DeMaagd, left, of DeMaagd Nissan in Battle Creek, Mich., receives a 40-year award for Nissan from Greg Ebbs, dealer operations manager for Nissan North America. 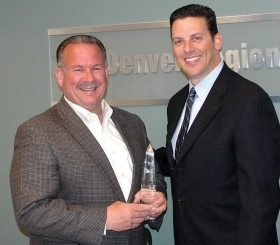 Kent Stevinson, left, of Stevinson Toyota West in Lakewood, Colo., receives a 40-year award for Toyota from Alec Hagey, general manager of Toyota Motor Sales U.S.A.'s Denver region.